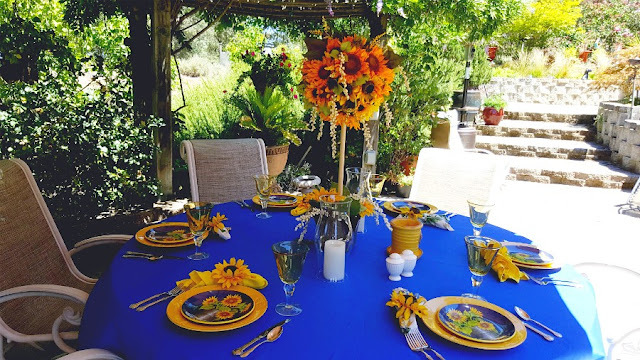 Welcome to an ALFRESCO TABLESCAPE BLOG HOP sponsored by Chloe @ Celebrate & Decorate I am so glad you have come for visit. This hop is all about Alfresco tablescapes. 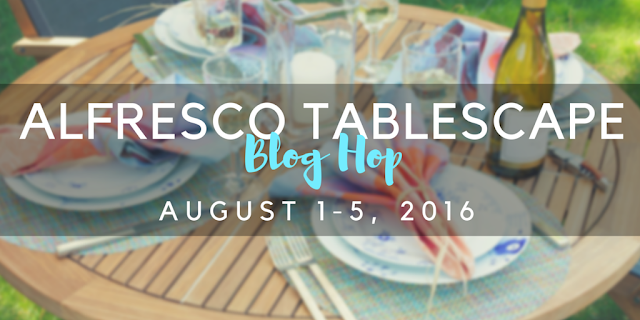 Many talented bloggers will be showing you their fabulous outdoor tablescapes. Sit back and enjoy! There's something special about eating outdoors. Taking in the beauty that surrounds us. Fresh air is always welcome. It's all about the sunflowers. I am using the bee plates from Horchow with these cute little blue plates with sunflowers. Our bee flatware compliments the plates nicely. Remember those sunflower napkin rings I made a while back? 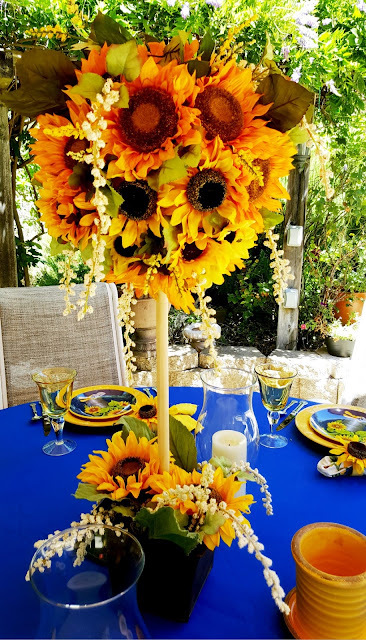 I created this pretty sunflower tree for the centerpiece. It all started with a large styrofoam ball and lots of sunflowers. You can see the buffet island in the background. My first idea did not work out so well. I had the idea to buy the flower shaped bread from Boudin's Cafe. 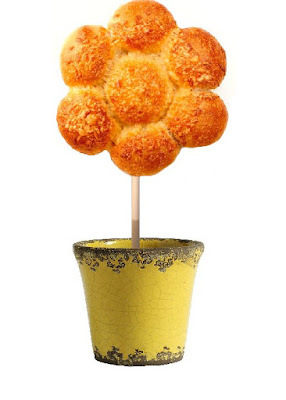 Unfortunately they said the flower shaped bread was seasonal. Isn't it flower time now? I wanted to put the bread flower on a skewer and set it in a flower pot. See the little yellow flower pot on the table? So, we compromised and made the existing bread into a flower shape on a platter. The buffet island looks pretty empty. Trust me, it was filled with yummy food. Thank you for visiting. 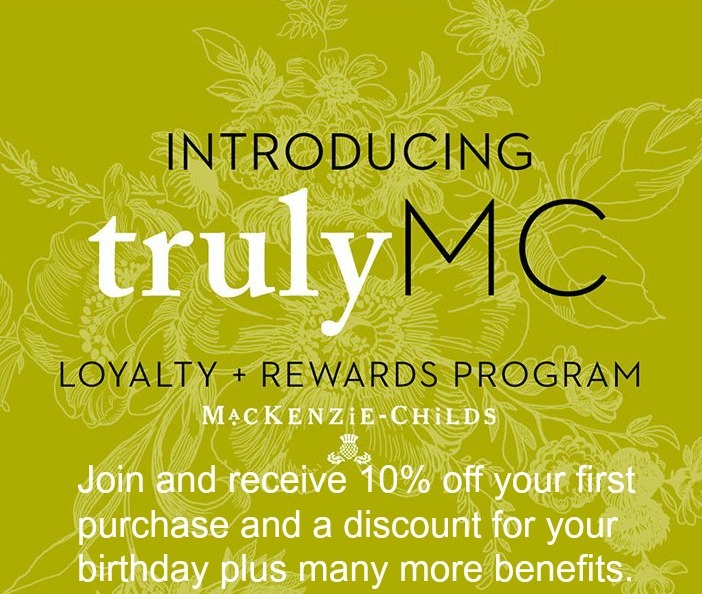 Be sure to check out the other blogs for this special event! great..........those are beautiful plates too. Thank you Nellie, this table was so much fun! I love the idea of making flower topiaries. Linda, your table is so creative. Love the sunflower topiary and napkin rings and what cute plates! Making your own napkin rings is a great idea. Most of the flower ones are so expensive. Your sunflower bread is very clever too.You have thought of every detail. I would love to have been a guest. Your food sounds wonderful. I would if you were a guest as well Bonnie. The dinner party was so much fun! 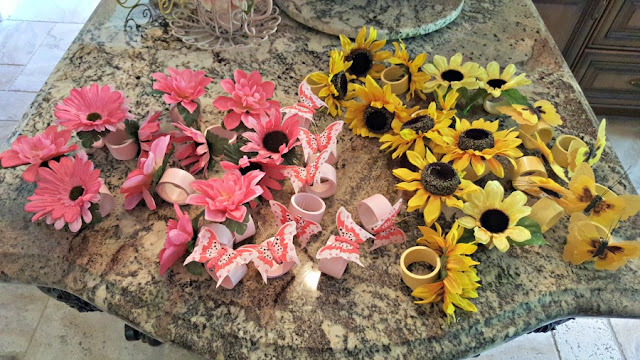 Making your own centerpieces and napkin rings can be so thrifty and creative. Oh, how I love sunflowers! They just make me feel happy! Paired with the rich blue is gorgeous, and the entire setting nestled under the wisteria has me swooning! Thank you Maureen. I do love the rich blue color with yellow. Sunflowers are such a happy flower. So pretty, Linda! 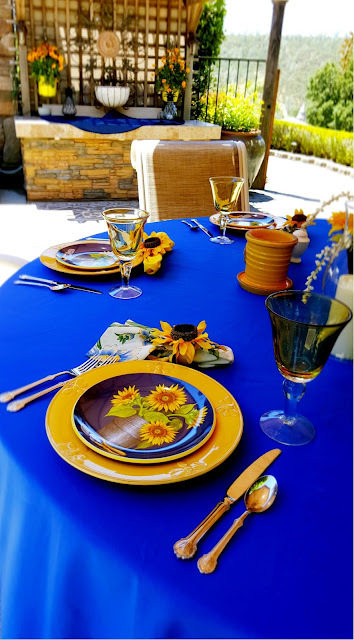 I love the yellow with the blue - perfect for the end of summer, and even more fun.. this would go nicely right into the beginning of fall! So fun hopping with you! Your sunflower topiary is so clever Linda! Sunflowers really sing summer for me, and I love them against the cobalt blue! What a great spot for an alfresco buffet too, just beautiful! OH WOW, I am transcended into italy! This look so tuscany inspired! You did such a beautiful job! I am in love with the colors. Doesn't that throw you when you have plans and then you can't find something or it is discontinued. You did a fine job of making up for it! 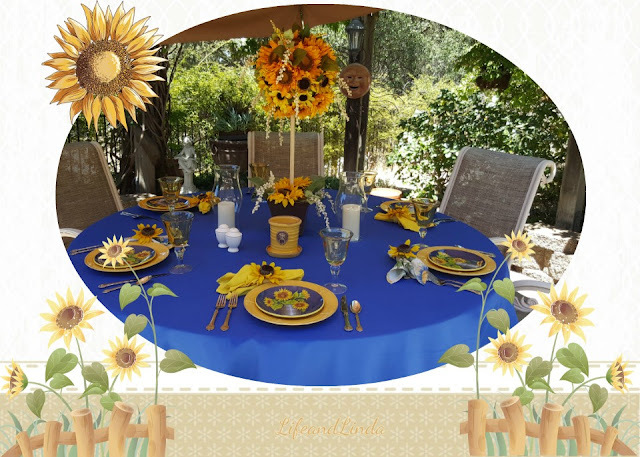 I love your sunflower topiary, it is perfect for your lovely sunflower blooming tablescape! I was thinking of using sunflowers on my front porch for the summer into fall look, but I might be too late and need to head into Halloween. 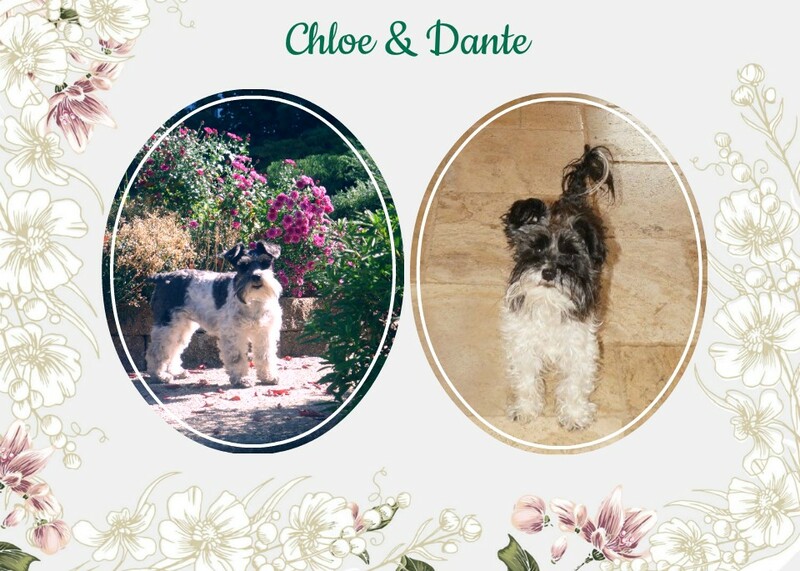 Like La Table De Nana said, your tablescape really says, "under the tuscan sun". thanks so much for participating in the Alfresco Tablescape Hop! this Sunflower Table is wonderful! Sunflowers make me smile. You did a fabulous job and have given me ideas for future topiaries. So creative! 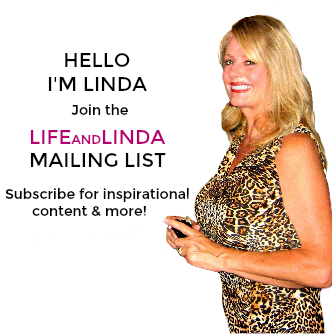 Great inspiration, Linda! I love those Horchow plates and flatware, and how you made the sunflower topiary. That orange peach pretzel salad sounds perfect for summer soiree. What a lineup of tablescapes for this week - glad you're part of it. Oh my goodness, this is beautiful! Everything is perfection. First I love the topiary that you made. Your stack of plates looks so lovely together. 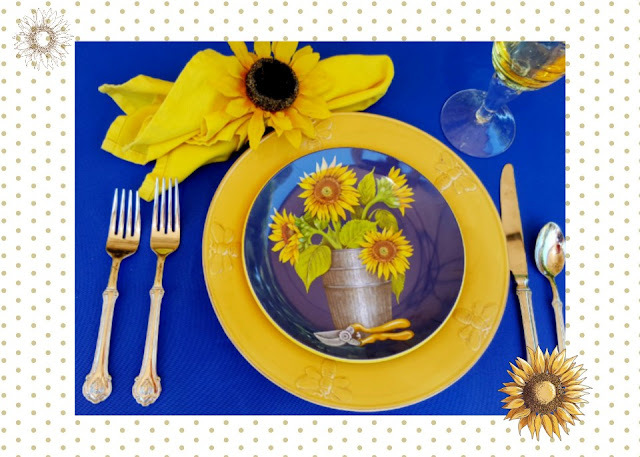 I have never seen the sunflower plates before, they are adorable. I love your choice of flatware as well. The yellow's and blue's are amazing together. And...what a beautiful setting to house the amazing table. Very pretty! Reminds me of my son's wedding with the deep blue and sunflower mix. Gosh I would have done something too had I known about this. Love the sunflower plates and the sunflower cake looks great- too bad the other idea didn't work out but this looks great too. 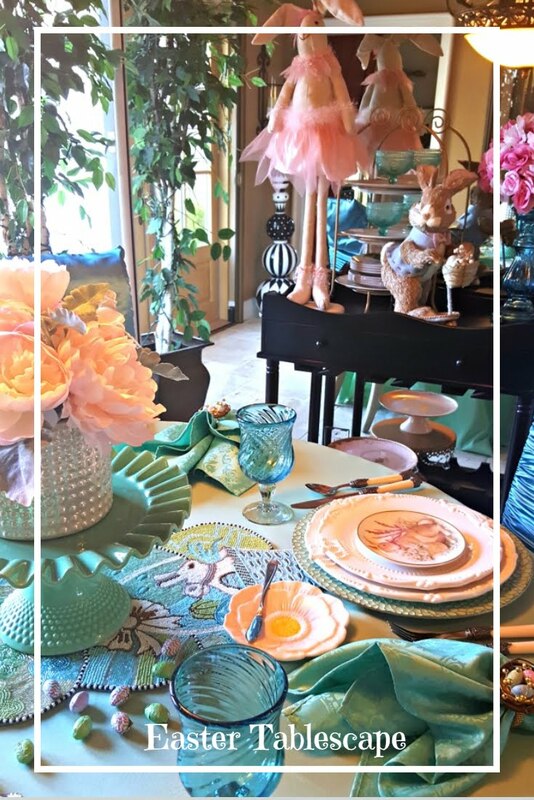 Linda, your tablescape is just beautiful! Sunflowers are such a happy flower. The bread idea was so cute! You have such creative ideas! Your table is beautiful...and it reminds me of Provence! I love sunflowers. Linda, this is absolutely stunning. Deep blues and yellows capture the essence of summer, and your details are just gorgeous! So pretty I used sunflowers too! 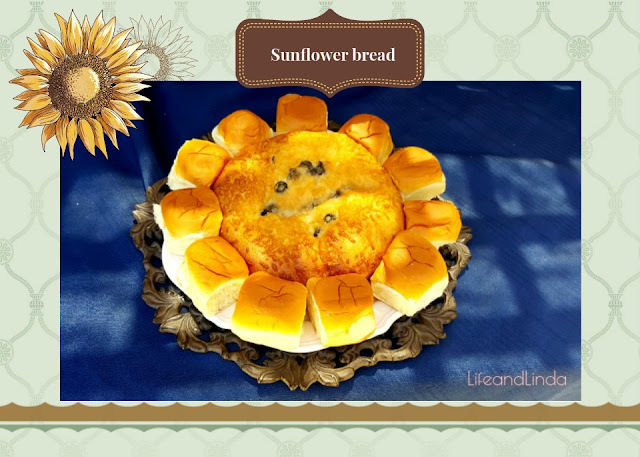 Linda, I love sunflowers too and I appreciate you trying to use the bread in your tablescape. Your table looks great! 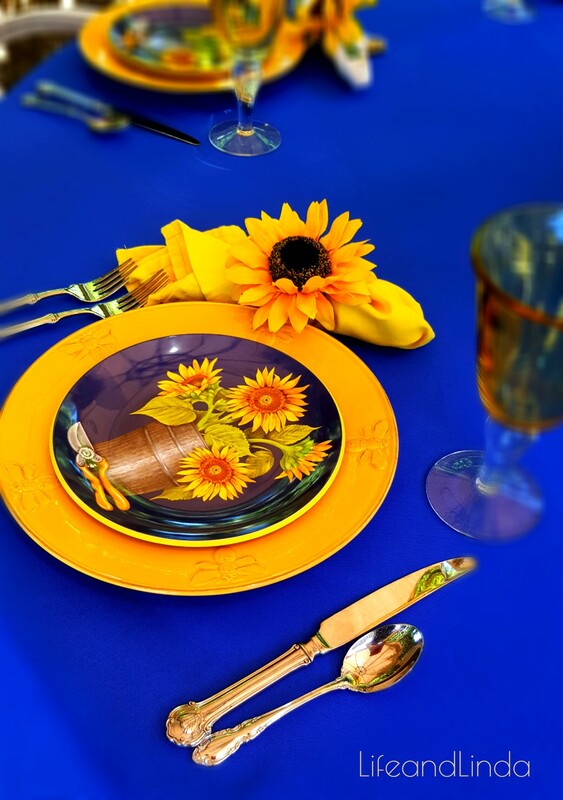 The sunflower napkin rings are perfect. It sounds like the food was delicious, too. 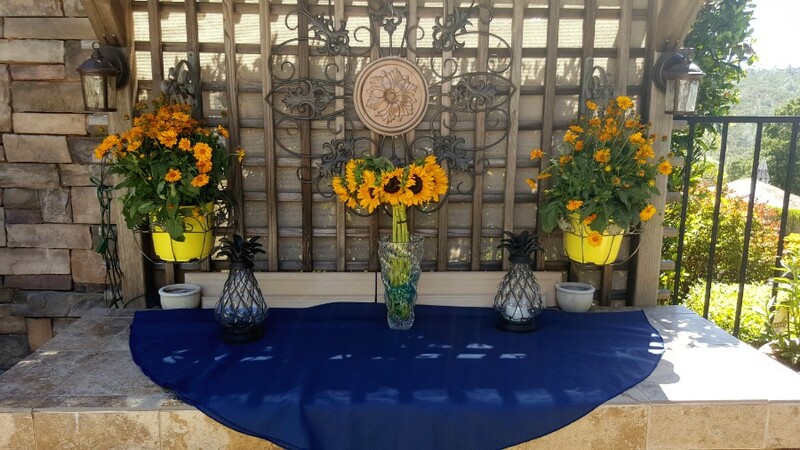 There are so many flowers that say "summer", but none more than sunflowers, and blue and yellow will always be a classic color combination. I'm sure your guests loved every minute of this dinner. Those plates are just darling, Linda, and I love your napkin rings, too. The sunflower topiary is a stunning centerpiece and it all looks so pretty on the blue tablecloth. I want to come to your party...the menu sounds fabulous! So many beautiful sunflower pieces and accents to tie your theme together perfectly. 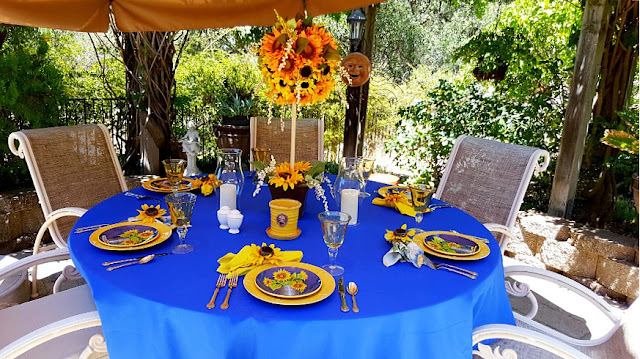 I love the pop of yellow with the gorgeous blue tablecloth - a wonderful colour combo! 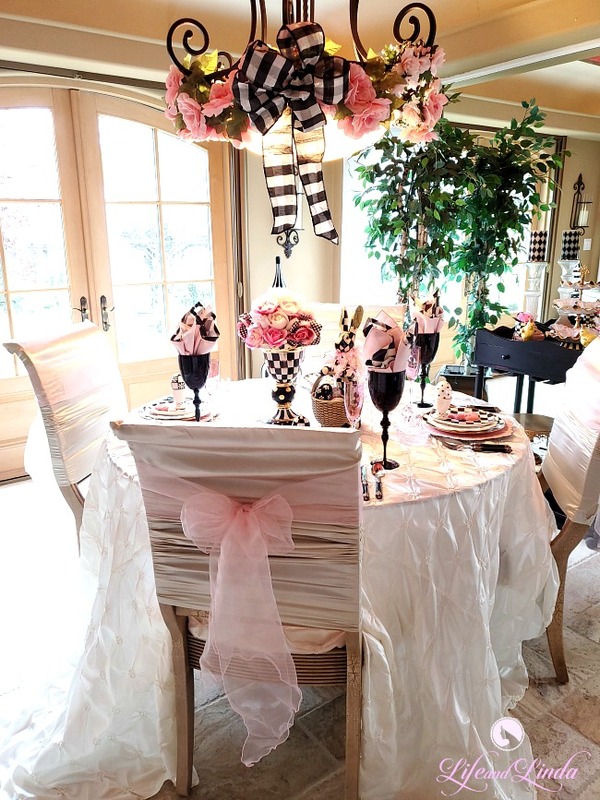 Your menu sounds delish - would have loved to be a guest a this lovely tablescape! 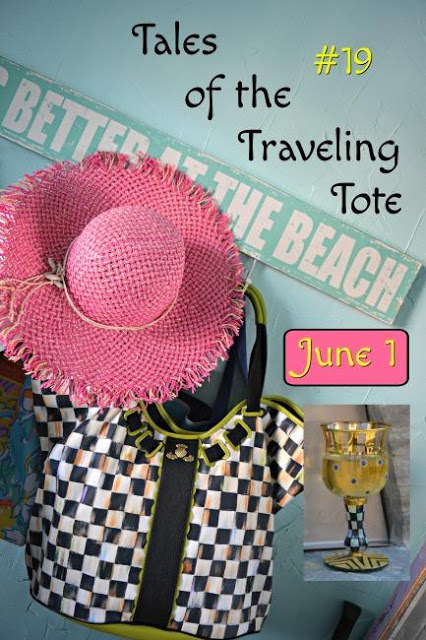 Your contribution to the Blog Hop has been terrific and shows that we are in for a fun week full of inspiration! Linda, I love those little sunflower plates. Tell me about the napkin rings. I have been looking everywhere for blanks to decorate. Congratulations on being a survivor. Thank you Myrna. I appreciate your kind comments. It's great to be alive! As for the napkin rings, my husband cut 1 1/2 " pvc pip into 1 inch pieces. I sanded and then sprayed painted them. Since the theme is sunflowers, I used yellow paint. I got the pvc pipe from home Depot. It was cheaper to buy the long piece of pipe, than to buy a 3 foot cut section. The guys at Home Depot cut it for me, so it would fit in the car. The total cost of the pvc pipe was $5.00. So, I got lots of napkin rings out of the pvc pipe. I bought sunflowers and cut them off. My husband drilled a small hole in each napkin ring and I hot glued a sunflower into the hole. Ta Da, sunflower napkin rings. What a happy tablescape you've created! I'm loving those napkin rings especially!! Very Tuscan in feeling. Wow, this is so gorgeous, I love how you went with a sunflower theme and they are absolutely perfect for this time of the year! 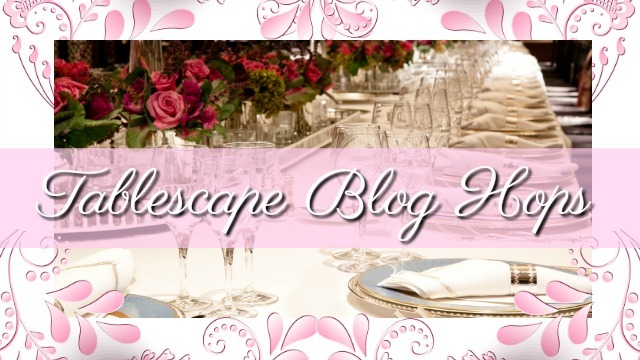 Your table settings are always gorgeous, Linda:) I am enjoying this blog hop so much! I hope you will share this with us on Thursday! Hi Linda, What a stunning tablescape. I am so fond of cobalt blue and yellow. Sunflowers are my favorite. The sunflower salad plates are darling. A perfect theme for an outdoor setting. It almost makes me feel like I am in Italy. Some wine and violin music and your guests would want to stay until dawn. Such happy colors! Love us some sunflowers! Linda, what a splendid summer table! It would really make outdoor dining an event! I love the sunflower centerpiece! So adorable! Those matching plates are super cute too! 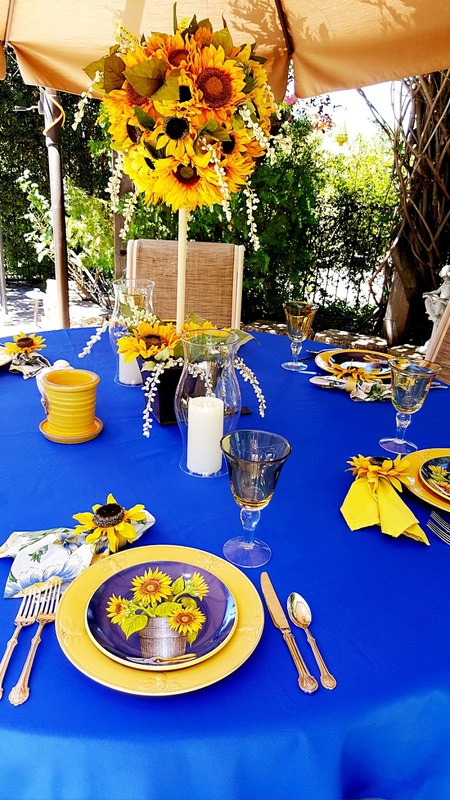 Beautiful table Linda, loving those bright colors and your sunflowers and napkins are gorgeous. Wow! What a gorgeous and provencale-esque table. 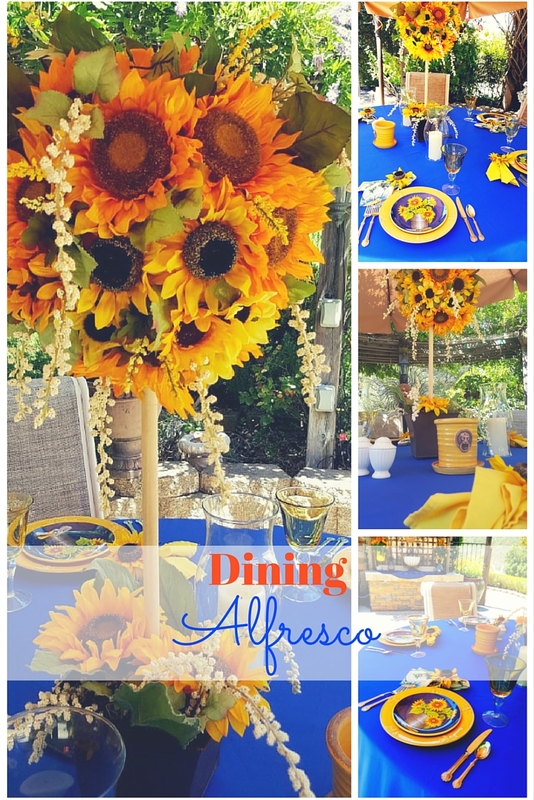 Love the cobalt blue with the sunflowers!